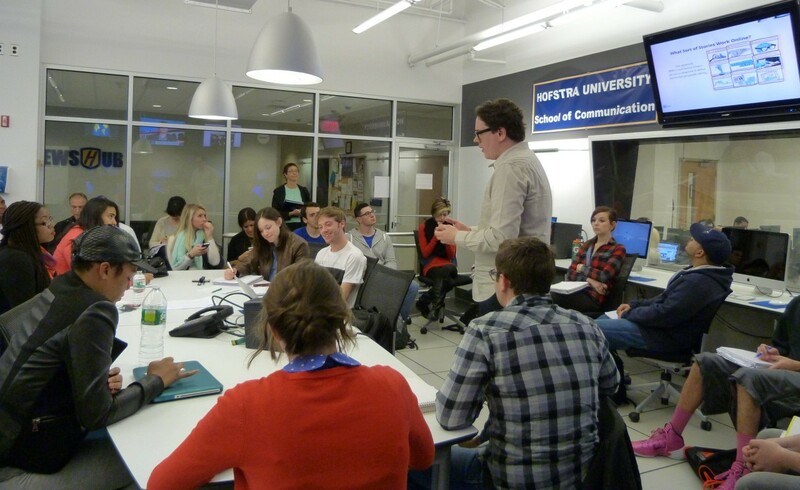 KUT Online Editor Wells Dunbar takes Hofstra students through a typical day in the life of a social journalist. Photo by Adria Marlowe. Social media are so tightly woven into journalism that many media organizations routinely now designate social media editors. On the job, journalists are learning how their role doesn’t end when they hit send on the story. Students - and faculty - need to know this too. The expanding field is also creating more job opportunities for journalism graduates, which in turn has created a demand for more social media instruction at journalism schools across the U.S. However, many journalism faculty, some of whom left professional newsrooms before the advent of social and digital media, themselves need social media instruction to develop effective teaching methods for digital natives. Since 2011, the Scripps Howard Foundation has worked with the Association for Education in Journalism and Mass Communication to address that knowledge gap by providing a space for selected journalism instructors to learn social media in the field with two weeks of summer training at newspapers, television and radio stations, and digital outlets. The competitive peer-reviewed program provides a $3,000 stipend to the professor for his or her living expenses during the summer visit and another $1,000 to a visiting professional from the news outlet, who then spends a week at the professor’s campus helping students learn how to use social media effectively. To date, 21 professors have participated at outlets ranging from the Knoxville (Tenn.) News Sentinel to the Miami Herald to Digitas, an advertising agency in Chicago, and the NPR affiliate KUT in Austin, Texas. The authors of this story, Kelly Fincham of Hofstra University and Leigh Wright of Murray State University, were among the six professors in the 2013-14 cohort. The group — Fincham, Wright, Joe Treaster of the University of Miami, Arthur Santana of the University of Houston, Byung Lee of Elon University and Pam Fine of the University of Kansas – presented their best practices and takeaways during the AEJMC conference in Montreal last August. KUT News Editor Matt Largey discusses the story budget with City Reporter Joy DIaz and Trey Shaar, Producer, All Things Considered. Photo by Kelly Fincham. At KUT (Kelly Fincham’s placement), the NPR affiliate used social media and analytics to measure the engagement on each story. Engagement is increasingly a key metric for journalists and publishers and KUT constantly works to improve their content’s visibility and shareability. It’s not about chasing traffic. It’s more about finding out what content resonates with the audience and why. KUT has had to totally rethink the role of the radio station, and their approach to this challenge has been instructive in helping prepare students for newsrooms where they will be expected to integrate social media into the news-gathering, reporting and conversational process. Wells Dunbar (the KUT professional who came to Hofstra) titled his presentation “What’s a print journalist doing editing the web for a radio station?” — cleanly summing up the way the platforms have converged. The real-life immersion at KUT has been invaluable for my social media classes. I came back with solid, actionable ideas on social media ethics, writing for social media, knowing which platforms work best and why, making content shareable and analyzing engagement. At the Scripps Treasure Coast Newspapers in Stuart, Fla., (Leigh Wright’s placement) reporters and editors live-tweeted events and discussed engagement with their audience. Murray State students seem to enjoy live-tweeting events and weaving relevant tweets into their online stories, and they are embracing Storify as an additional tool in their social media writing toolbox. The digital-first model is introduced in the intermediate-level reporting class where students post their news stories online and must include social and multimedia links. Students must think about the usage of social media in their postings as they write their stories. They also need to think about getting their stories to a digital platform and engaging with the audience through a variety of multimedia and social media tools. On the job, journalists are learning how their role doesn’t end when they hit send on a story. In some ways, their job is starting again because now they must engage with the audience and do follow-up via social media. At Hofstra, the social media class created the Tumblr Social Elements to help other college students learn about best practice in social media. Instead of traditional readings and quizzes, the students are given writing assignments where they highlight the main takeaways from key readings on social media trends. The best are posted on the Tumblr site and shared through social accounts specifically set up for the project. The Tumblr project offers students an interactive learning experience which would have been impossible before social media. It also empowers them because they are learning how to use social media effectively while also helping to build their own brand. The first assignment for the Social Elements team was to create their own social media policy. The students reviewed current practices in newsroom and organizational ethics and policies and wrote individual policies aimed at student journalists. The class then voted the best content onto the Social Elements Tumblr. Students are much more engaged when they’re thinking about their peers. This assignment gave them a deeper, experiential understanding of current thinking on social media policies. Tumblr is ideal for analytics because students can use Google Analytics to begin learning about engagement and metrics. 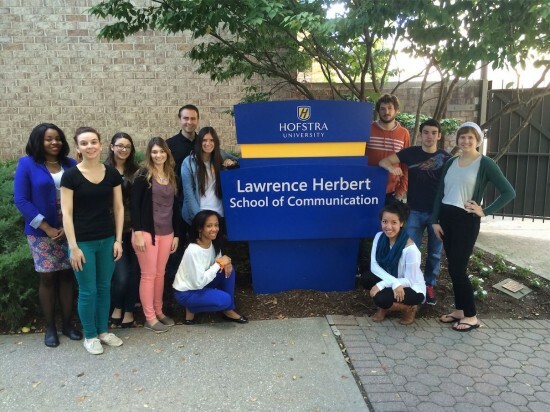 The Social Elements team at Hofstra University. Photo by Social Elements. At Murray State, the capstone students write an in-depth public affairs project for print, broadcast and online platforms and then devise a social media strategy to promote it. This approach was based on discussions with the analytics team at TCPalm.com. Editors at the Scripps Treasure Coast Newspapers gather every afternoon to discuss the top stories of the day and analyze the metrics behind their social media postings. This type of data in real time helps news professionals determine which stories resonate with readers, and today’s students must be aware of how their postings on social media can affect their organization’s traffic. Students need to become aware of how to build a social media strategy, and thus, the exercise helped them to develop an awareness of social media beyond merely posting a Twitter update or a Facebook status. They learned that not only did the words matter, so did the timing of their posts. At Hofstra, the students use Hootsuite, Facebook Insights and Google Analytics to measure their reach and engagement with Social Elements. The students set their own goals and objectives, and this hands-on element drives increased student participation in and out of the classroom. The first goal was to get to 100 likes on the Facebook page, and they had that sorted in a couple of hours. The class has also completed the Hootsuite Certification Exam which Hootsuite offers as part of its free educator package. They’re learning how to manage the flow of social information, as well as learning about metrics and audience engagement. Fine’s students also used social media for reporting. They covered The Big Event, a student volunteer activity, created a Storify and then posted the link on the school newspaper social media sites. At Murray State, students covered a campus-wide lecture via Twitter and then created a Storify in which they folded their own tweets along with narrative to add context. 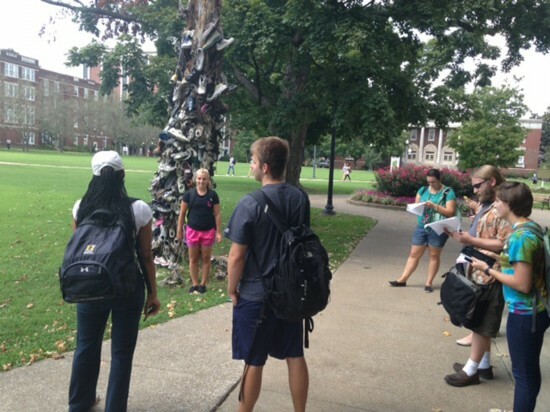 Students at both Murray State and Hofstra do a modified version of the Scavenger Hunt, a great way to introduce students to social media reporting, as it requires them to quote sources, take photographs and shoot video about their respective campuses. The use of Instagram and Vine is encouraged to help students think about the need for visual storytelling. For many students, this is the first time they’ve used social media in such a way, and students can see how much attention their content can generate. Storifies are essential to Scavenger Hunts. The narrative spaces in the Storify allow the students to add context and transitions between items found from the hunt, and thus the students end up writing a multimedia social media news or feature story. The exercise has helped our students develop an appreciation for social media’s role in news writing. Students on outside assignment at Murray State. Photo by Leigh Wright. Fine recommends teaching students how to find story ideas and sources via social media, including monitoring hashtags on Twitter to gauge public sentiment on an issue. At Hofstra, students use the social media management system Hootsuite Pro to monitor current news stories and organize lists of sources for future news stories. The class uses Storify to present the curated content and embeds the stories into the Tumblr accounts, which are then shared through their social media profiles. At Murray State, student curate current event tweets and web stories in a separate copy editing class and then present curated Storifies to the class. The journal author, Stephanie Bor, who is herself a 2012 alum of the AEJMC/Scripps Howard fellowship, highlights the necessity for journalism faculty to be able to teach social media with a holistic approach to best integrate theory, assigned work and in-class (or virtual) discussion. However, given that many journalism faculty left newsrooms before the rise of social media there are clear gaps in knowledge on campus about the evolving best practice and norms for journalists and social media. It is not uncommon for journalism faculty to report that their colleagues dismiss social media as promotional only or a waste of time. Additionally, many faculty believe that the so-called digital natives do not need instruction in social media skills. This is where programs such as the AEJMC/Scripps Howard Foundation Visiting Professorship in Social Media can help to fill those gaps and train faculty to guide students to the next generation of social and digital media jobs. Assistant professor Kelly Fincham teaches journalism at Hofstra University, where she developed the award-winning Long Island Report. She has worked in journalism in New York, Dublin and Sydney and is the founding editor of Irish Central. Her website is at www.kellyfincham.com, and she’s on Twitter @KellyFincham. Assistant professor Leigh Wright teaches journalism at Murray State University, where she serves as head of the journalism sequence and directs an annual high school media workshop. She has worked in journalism as a reporter, section editor and columnist for a regional Kentucky newspaper and continues to freelance for national and regional publications. Follow her on Twitter @leighlwright. Hi guys, thanks for including KUT 90.5, Austin’s NPR station, in your coverage. When you get a moment, could you please correct our station call letters to “KUT.” Thanks very much.